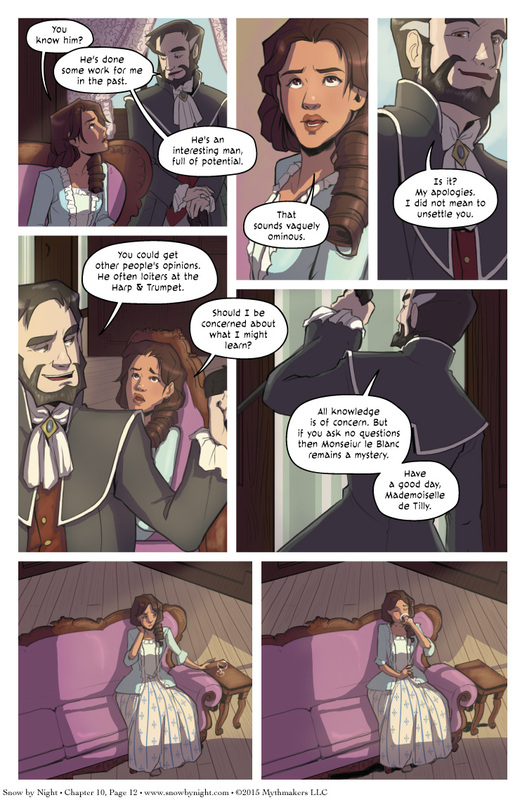 Cienan has some words of advice for Jacqueline on Chapter 10, Page 12. His words are troubling for Vivienne’s aide-de-camp even if they are informative. Our scene shifts next week. To see who’s back, please vote for Snow by Night on Top Web Comics. Whatever else you say about him, that was some DAMN good advice! I think it’s great characterization when I can’t tell whether someone is a villain or not. Because that was very helpful to her, and sound advice to anyone, whether or not he’s a “bad guy” in the end. I like Cienan a lot. You are right, Cienan has motives for sure. Being on the top of that list would probably be not letting “Monsieur Le Blanc” have an opportunity to jeopardize the business relationship with the that Cienan has worked hard to foster over several years. Another motive might just be that if Jacqueline heeds his advice, she will owe him one. A man in his position deals a LOT in favors owed. Is it good advice? Hell yes. But does that mean I can trust him? Hell no! The rabbit hole gets even deeper. He is a very unsettling person isn’t he? Oh, Jassart. You’re a liar and a sneak, but Cienian is better at it than you’ll ever be. You’ve got another thing coming.